Zoya will ship out your NEW polish! HOORAY! Once we receive your polish, we do the rest! It’s that simple! *Offer valid online at www.zoya.com only. Offer expires on 4/26/2012 at 11:59PM EST. Continental US ONLY. Not valid with any other codes, coupons or promotions. Shipping and handling fees apply. Consumer accounts must exchange a minimum of 6 polishes with a 24 bottle maximum. Salon accounts must exchange at least 12 with a maximum of 48 bottles. Polish can be from any brand EXCEPT Zoya, Qtica or Nocti and can be exchanged for in-stock .5oz Zoya Nail Polish. Excludes all Zoya PixieDust Collection shades. Offer is not contingent on customer returning polish. Zoya Exchange code is unique and non-transferable. One code per account. Art of Beauty is not responsible for incorrect addresses, credit card entry errors or errors associated with declined credit cards. Please allow standard time for processing and shipping, however if volume is higher than expected please allow up to 6 weeks for shipping and processing. 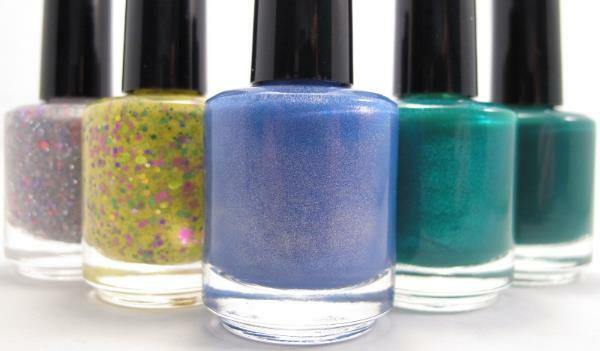 Art of Beauty, Inc. reserves the right to remove any polish that is out of stock from your order. You will not be charged for this polish. Backordered polish is not included in this promotion. San Francisco by OPI brings street chic style with West Coast flair to nails and toes for Fall/Winter 2013. This new collection features a palette ranging from sky and sea-colored hues of blues and gray to reds, burgundies and browns inspired by some of the city’s most iconic elements – Chinatown, the Golden Gate bridge and the Embarcadero. This fall mélange is mixed with texture, seen in three new Liquid Sand nail lacquers in earthy hues of taupe, blue and gray: It’s All San Andreas’s Fault, Wharf! Wharf! Wharf! and Alcatraz…Rocks. Liquid Sand lacquers dry to a textured, matte finish, infused with reflective sparkle. A-Piers to Be Tan - I shore do like this chocolaty tan. Dining al Frisco - Just feast your eyes on this fresh-air blue! Haven’t the Foggiest - Can’t tell you why I love this misty gray...I just do! Peace & Love & OPI - This holographic sage and eggplant is far out! Keeping Suzi at Bay - There’s no holding back this assertive navy blue. Incognito in Sausalito - You better keep this almost-black blue under wraps. Lost on Lombard - Oh garn-et! I’m all turned around! I Knead Sour-Dough - Are you bready to wear this toasty warm brown? Muir Muir on the Wall - This trailblazing plum is the fairest of all. In the Cable Car-Pool Lane - Good golly, Miss Trolley, this rich burgundy takes me away! Embarca-Dare Ya! - Betcha can’t pass up this marvelous magenta. First Date at the Golden Gate - You and me and this shimmery ruby make three. It’s All San Andreas’s Fault - I’d move mountains to get this textured earthy taupe! Wharf! Wharf! Wharf! - Dog-gone it...fetch me that textured matte blue! Alcatraz...Rocks - There’s no escaping this arresting textured gray. 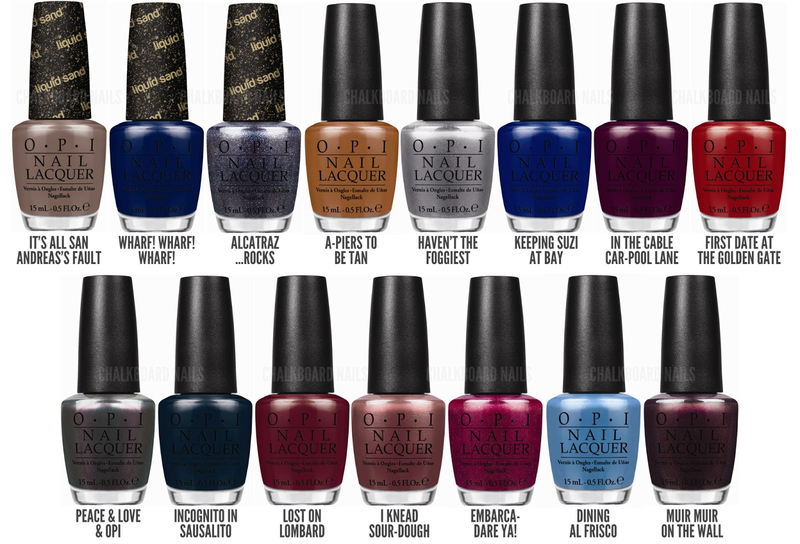 San Francisco nail lacquer shades each feature OPI’s exclusive ProWide Brush for the ultimate in application. Liquid Sand nail lacquers should always be worn without top coat. San Francisco by OPI will be available August 7, 2013, at Professional Salons, including Beauty Brands, Beauty First, Chatters, Dillard’s, jcp Salons, Pure Beauty, Regis, Trade Secret, ULTA and ulta.com for $9.00 ($10.95 CAN) suggested retail for each nail lacquer. Does your driver’s license have that little heart on it indicating that you are a registered organ donor? If not, this is the month to get registered. April is National Donate Life Month. In celebration of National Donate Life Month, OPI Nail Polish has teamed up with Taylor’s Gift to release a limited edition nail color called Taylor Blue to help raise awareness about the life saving gift of organ donation. Taylor Storch was a vibrant young lady whose life was cut short by a tragic skiing accident on a family vacation in Colorado. Her family did what they believe she would have wanted by donating her organs to people on various waiting lists. They also started the Taylor’s Gift Foundation to help raise awareness about the gift of organ donation. You can help by purchasing OPI’s limited edition Taylor Blue and posting a picture of your painted nails to your favorite social media site with the tags #TaylorBlue and @TaylorsGift. Help Taylor’s Gift paint it forward. Find out more by visiting TaylorsGift.org/TaylorBlue. China Glaze introduces Texture, a unique new lacquer that applies as a creme but dries with a 3D texture effect. Unlike traditional nail art techniques that require multiple steps, Texture only requires one step — painting the nail. Texture dries matte, but can be combined with China Glaze Fast Forward Top Coat for a glossy effect. With a finish similar to that of a sugared rim, Texture is the perfect accessory for a beach day, night-on-the- town, or special rendezvous. The China Glaze Texture collection will be available in May 2013 at fine salons and beauty supply stores nationwide. China Glaze nail lacquers are available through salons and professional beauty supply stores nationwide. For more information, please visit www.chinaglaze.com or follow China Glaze on Facebook, Twitter, and Pinterest. Nicole by OPI launches Gumdrops – six new limited edition matte texture shades designed to give nails a mouthwatering manicure. With a “sugar-like” finish that lightly shimmers with fine glitter particles, Gumdrops features brilliant candy colored hues. “These shades are sure to satisfy any sweet tooth,” explains Suzi Weiss-Fischmann, Nicole by OPI Co-Founder & Artistic Director. “By combining groundbreaking texture technology with some of the hottest trends including matte and shimmer finishes, Nicole by OPI has created a new line of lacquers for cutting-edge manicures. Worn without top coat, Gumdrops lacquers dry to a textured matte finish to give nails a “sugar” coated appearance. I Lilac Gumdrops - But I love this sugar-frosted lavender. My Cherry Amour - You're the one magenta I adore. Candy is Dandy - This sweet pink is my favorite guilt-free treat. Cinna-man of My Dreams - I dream in shades of this warm spice pink. Blue-Berry Sweet on You - I’ll be true to this berry blue hue. A-Nise Treat - This shimmery licorice is everyone's favorite. Nicole by OPI Gumdrops nail lacquers should always be worn without top coat to achieve the unique textured matte finish. Nicole by OPI formulas are long-lasting, fast-drying, and salon-quality. This limited edition collection will be available beginning May 2013 for $7.99 each at retailers including select Walmart (May 2013), CVS (June 2013), Rite Aid, Kmart, Kroger, Ulta, H-E-B, and Duane Reade locations (August 2013), In Canada, these shades will be available for $10.99 each at Shoppers Drug Mart, Walmart Canada (July 2013), Jean Coutu, Loblaw, and London Drug (August 2013). Announcing "Spring It On Me! ", the latest collection available from Girly Bits Cosmetics. 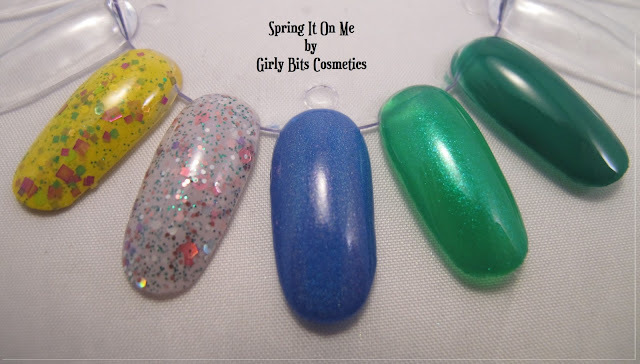 A Collection of five spring themed lacquers. Spring It On Me! ~ a lightly tinted, lavender leaning milky base, with pink, pink holo, green, white, silver, and purple holo glitters. It's meant to be layered, and looks best over light pastel colours, or white or grey. Going Bananas ~ a yellow crelly with multiple shades of green, chartreuse, pink, lavender, purple, fuchsia, and a hint of aqua shimmer. Bachelor's Button ~ a cornflower/periwinkle blue holo. This beauty is SO hard to photograph. Emerald City Lights ~ a shimmer top coat. A nod to the love of the Columbian Emerald and it's deep green and the subtle blueish glow from within. Energizing and calming all at the same time. Emerald City ~ a creme/jelly that gets full coverage in three coats.